The Lincoln Center Institute Junior Spring Benefit is less than a week away and young New Yorkers are gearing up for what is known amongst the in-crowd as one of the most fun charity benefits of the year! Tickets are SOLD OUT but 20 Party Tickets have been reserved for a lucky few Guest of a Guest readers so make sure you purchase yours here now! 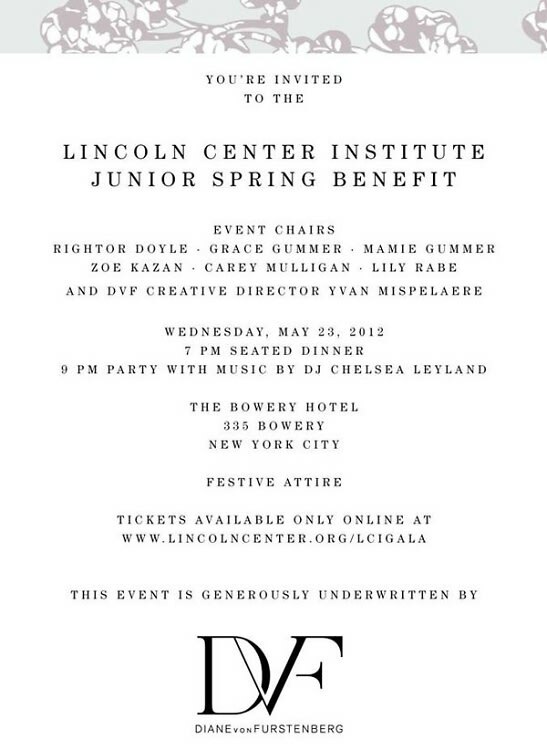 Not your typical uptown stuffy affair, the LCI Junior Benefit is chaired by young 'downtown' film, theater and TV actresses Carey Mulligan, Grace Gummer, Mamie Gummer, Zoe Kazan, and Lily Rabe. What a line-up! The party will include music and dancing at The Bowery Hotel and benefits Lincoln Center Institute, the educational cornerstone for Lincoln Center for the Performing Arts, which brings art into public schools across the curriculum. 20 tickets have been reserved for GofG readers so make sure you purchase yours here now!